We have emerged as reputed name by providing quality range of Aroma Therapy Products such as Carrier Oils and Aroma Oil. These oils are used for face and body message as the oils provide great relief from stress, skin infections and hair loss. 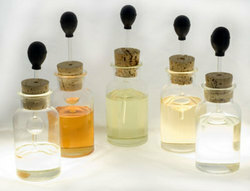 Our range is appreciated for good fragrance and effectiveness. We offer wide variety of Carrier Oils such as Sweet almond oil, Wheat germ oil, Evening primrose oil, Sesame oil, Olive oil 1liter, 5 liter and Sunflower oil (cosmetic quality). Sourced from leading vendors, our range is widely used for facial and body message. Looking for Aroma Therapy Products ?